Meet Linhuraptor exquisitus, a new dromaeosaur from the Djadokhta Formation in Mongolia. Other dromaeosaurs in the area include Velociraptor mongolensis, V. osmolskae, Tsaagan mangas, and Mahakala omnogovae. I'm warry about the validity of the second taxon, and that last one might be a basal paravian, but hey, that's quite a crop of vicious little raptor dinosaurs. 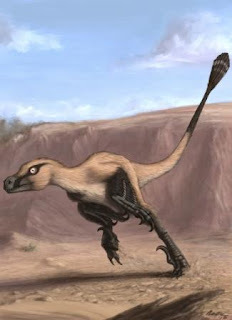 Linhuraptor is most closely related to Tsaagan and shares many unique characters with it, so the two likely form a monophyletic group. Additionally, the skeletal details of Linhuraptor place it nicely between the Chinese "microraptors" and the more advanced dromaeosaurids like Velociraptor and Deinonychus. Even individual taxonomic families have their own "transitional forms." There's a nice progression of skeletal features from Gondwanan unenlagiines up through microraptors and these new "Tsaaganines" (my own term) toward familiar dromaeosaurines. The holotype is incredibly beautiful (hence the specific epithat) and complete. This picture is NOT the holotype, but a CAST of the holotype. "On the basis of positional homologies, we identify the manual digits of Linheraptor as corresponding to the middle three digits of ancestral archosaurs, as is currently hypothesized for all maniraptorans (Xu et al. 2009)." This is somewhat misleading. The authors have taken the rather bold step in implying that the Limusaurus argument--that a frame-shift occured in finger development to switch manual digits I-III to II-IV--is generally accepted. This is not true. Andrea Cau, Darren Naish, myself, and others have pointed out that Limusaurus' shrunken hands and stubby fingers are more a consequence of its lineage (ceratosaurs) than some grand frame-shift at the base of the Neotheropoda. Furthermore, based on the photos I'm looking at, the arms and hands of Linheraptor are incompletely preserved and not fully prepared. Without a complete, well-preserved hand in hand (HA! ), the authors are making a big assumption about not just the manual development of Linheraptor, but all maniraptorans and, in citing Limusaurus specifically, all neotheropods. I think that's irresponsible at best, and axe-grinding at worst. 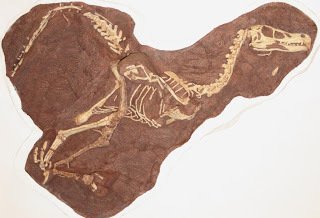 Anyway, the fossil itself is beautiful, it adds to the diversity of both Dromaeosauridae and Mongolia's raptor family, and it speaks to the evolutionary history of the group. I just wish that the authors had left that rather unneccesary remark about finger development out. It's not especially relevant, and comes off as chest-puffing.